“It's a perfect window to the project,” said Nathaniel, referring to the Sussex Trail that overlooks this portion of the upper Paulinskill River. Nathaniel Sajdak and Eric Van Benschoten of the Wallkill River Watershed Management Group (WRWMG) and Michelle DiBlasio of the Nature Conservancy (TNC) escorted me along the Trail and through several sites, proud to introduce the Paulinskill River Restoration Project, proud to share their five years of successes and failures. The three co-stewards, all locals, waved to every cyclist that passed. Their work may sound mostly environmental – planting trees along riverbanks. But the payoff permeates far wider than the restored river. The project's visibility helps build said movement. 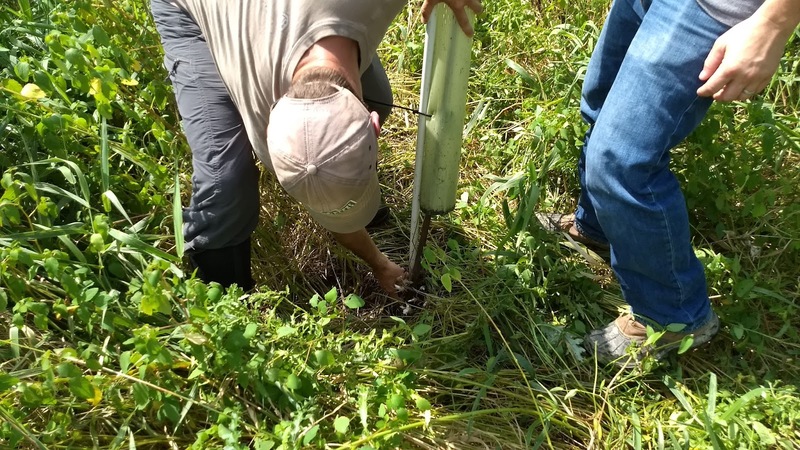 "People notice that there was nothing here five years ago," Nathaniel explained, only fields of invasive canary grass and eroding riverbanks. Now thousands of saplings spring from plastic trunk guards. On the opposite ridge a steady stream of cars flows down Route 15, alongside the popular Chatterbox restaurant and the historic Jorritsma farm. Both have allocated land and support to the project. A little downstream lies McKeown Elementary School, a source of volunteers and an incubator of future land stewards. With persuasion from WRWMG, the school installed a rain garden and is now considering porous concrete – two projects designed to reduce rainwater and pollutant runoff into the Paulinskill. 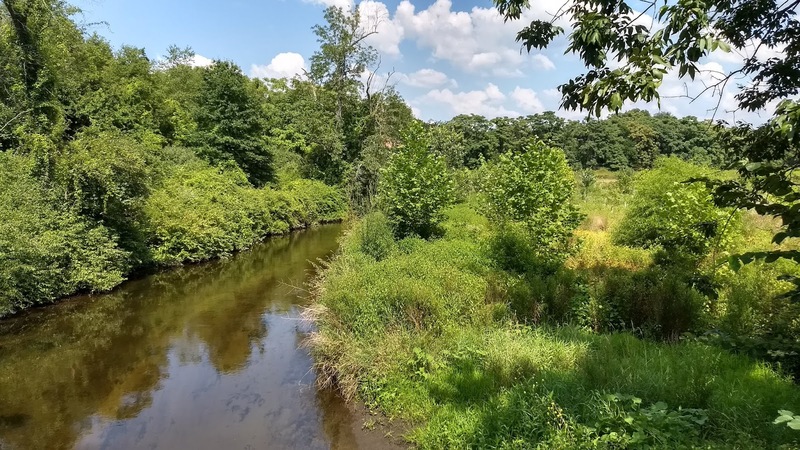 Together TNC and WRWMG have planted 31,503 trees since 2012, reforesting 77 acres of riparian area along eight miles of the Paulinskill River. Through outreach and recruitment of new partners, the stewards plan to restore longer stretches of the river. 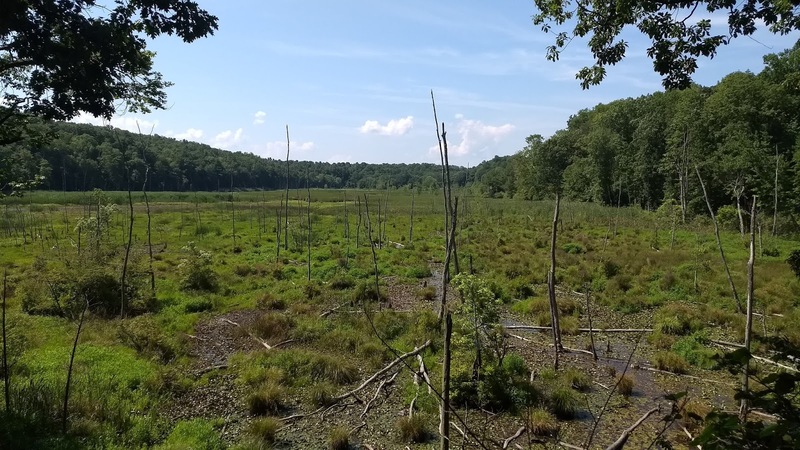 The goal is to plant one hundred thousand trees throughout New Jersey's watersheds by 2020, fifty thousand the Paulinskill, and also install interpretive signs to help inform the community. 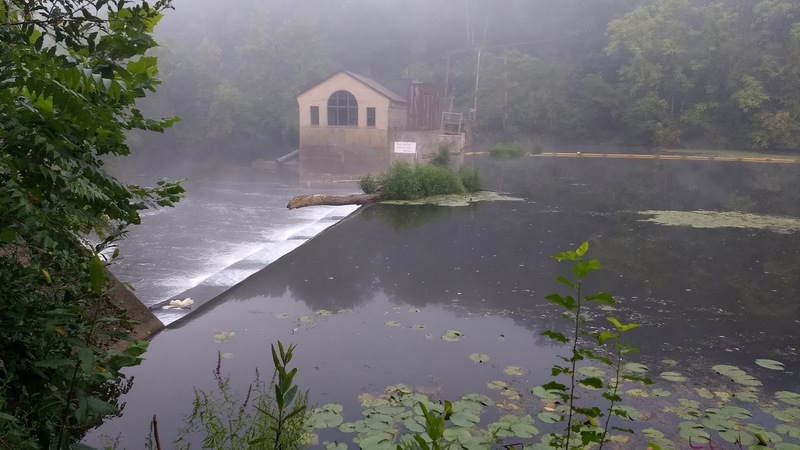 An upcoming removal project of the Columbia dam, near the Paulinskill's confluence with the Delaware River, will hopefully permit the entrance of anadromous fish. 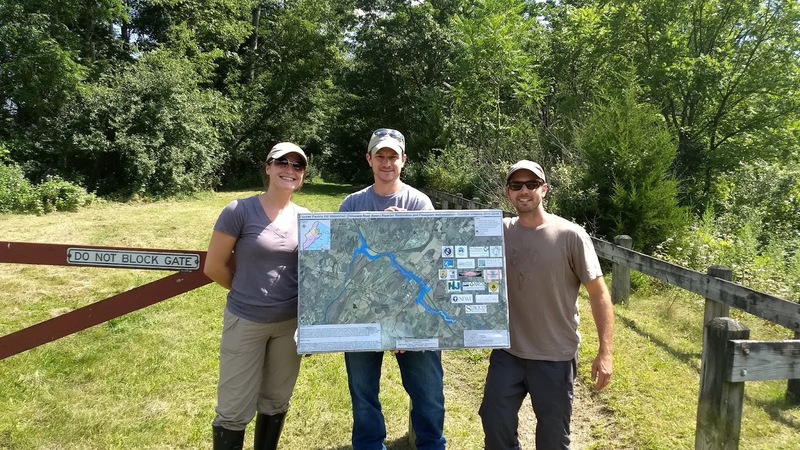 Why restore the Paulsinkill River? “It ties into the bigger picture,” explains Michelle. The Paulinskill feeds the Delaware (it's 3rd largest tributary) which in turn provides drinking water to millions of people. "It's also about getting people to acknowledge its importance." The Paulinskill is a haven for recreation, fishing, birding and hiking. 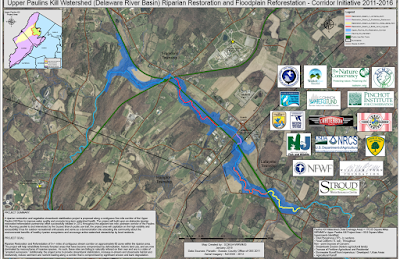 Its watershed drains 176 square miles of mostly rural, northern New Jersey. Much of the region was deforested throughout the 1700 and 1800's and converted to farmland, like the PRRP site along the Sussex trail. Centuries of plowing and grazing stalled natural succession, explaining the site's treeless, eroding banks prior to the project. Reduce water temperature - and, more importantly for trout, the daily fluctuation in temperature. Achieved by trees, which can cast shade and can eventually add obstructions (log jams) that help form deeper and cooler pools. 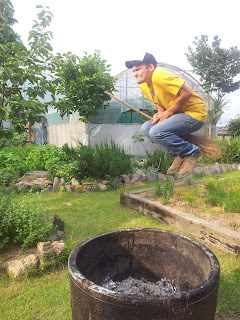 Reduce sediment load - i.e. improve water quality. Also achieved by trees, which can slow runoff and stop erosion. Improve invertebrate habitats - Depending largely on the factors above, the presence of invertebrates such as freshwater mussels are keen indicators of river health. Also achieved, in part, by trees. “Can't believe I'm standing under a shade tree,” Nathaniel admits. 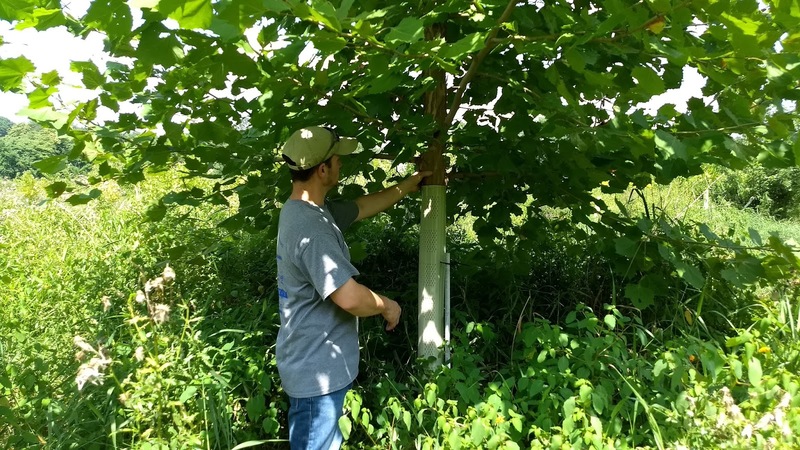 Species are native bottomland hardwoods, such as red and silver maple, river birch, American sycamore and black willow. Eleven tree species in total, according to Michelle, and 13 species of native shrubs. Seedling type are containerized seedlings, bareroot saplings or transplants salvaged from nearby riparian sites. Maintenance involves period checking for fallen trees, usually due to storms or vines. These methods were perfected the hard way. 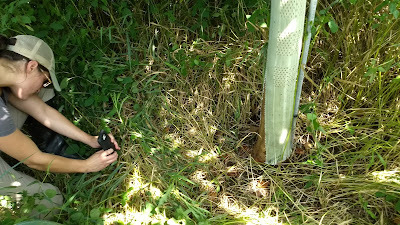 Initial plantings used 3' mesh guards rather than the 5' tree shelters, and used shorter, wooden stakes rather than the 6' PVC. A perfect storm of factors led to total loss, thousands of trees dead. For one, deer would browse any foliage that grew above or through the mesh, permanently stunting trees. “Initially we though it was deer,” Eric said when asked their greatest hardship, “but actually rodents were the worst.” The mesh did nothing to stop voles from feasting on the lower trunks, girdling and killing the trees. Furthermore the former stakes would rot, being wood, and were often blown off their fasteners, being short. Now, since the appropriate upgrades, the tree survival rate has grown from zero to around 85%, estimates Michelle. 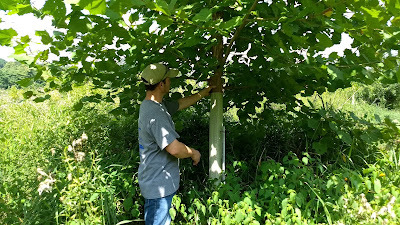 (Above) Michelle documents a new achievement for the site: a sycamore bursting free from its tree guard, as the guards are designed to allow once the tree grows large enough to survive without it. (Below) Eric inspects a lost tree. Its guard must have blown loose and invited a feast for voles. As well as teaching how to perfect their methods, the hard lessons have also taught which methods to perfect. In early years they tried spot spraying to control invasive canary grass, but that only cleared space for more troublesome invasives like Canadian thistle and black mustard. 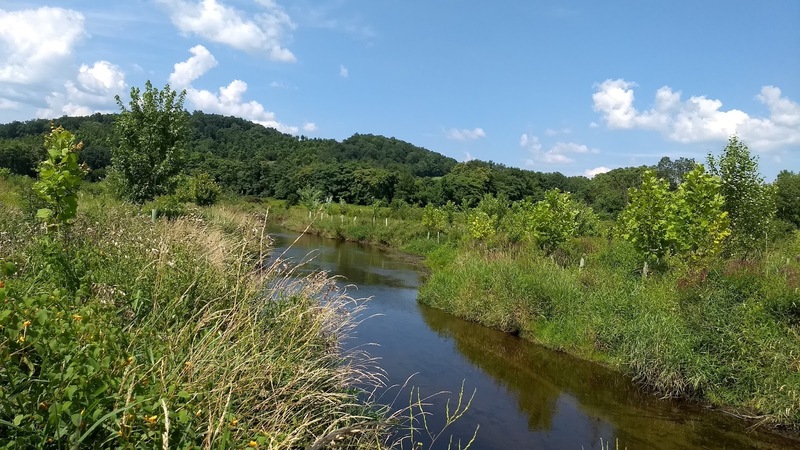 On an earlier project they tried heavy machinery to stabilize streambanks, but that was “one headache after another,” said Nathaniel, and while ultimately successful, it wasn't worth the cost. From their experience, reforestation surpasses other labors in a cost-benefit analysis. Unlike many reserves, with trigger-happy stewards armed with GPS-guided bulldozers and herbicidal crop dusters, here the ground work focuses on tree planting – work better suited to inviting volunteers and inspiring the community. 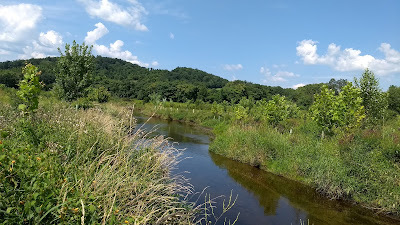 Besides, the trees will eventually solve those peripheral problems: canopies will shade out invasive plants; roots will strengthen streambanks and slow erosion. 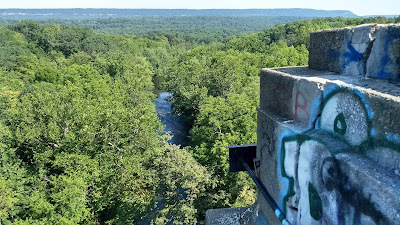 A Bird's-eye view from the Hainesburg viaduct, once the world's longest. The soon-to-be-removed Columbia Dam. Dam removals are key to river restoration. one of nature's purification systems. The Nature Conservancy: "Restoring the Paulinskill River,"
Wallkill River Watershed Mangement Group: "Upper Paulinskill Watershed Restoration Plan"
"Streamside Forest Buffer Protects Water Quality, Habitat and Organisms," a summary of related studies.